Belmont Biology Department faculty members Drs. 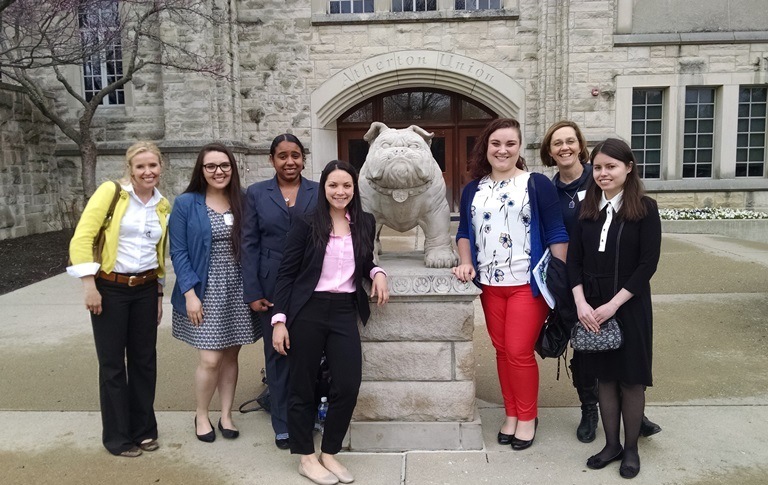 Darlene Panvini and Laura Stephan, along with 5 biology, biochemistry & molecular biology and neuroscience majors, attended the 28th Undergraduate Research Conference at Butler University in Indianapolis, Indiana on April 8. The conference was attended by more than 900 individuals representing 58 colleges and universities from 11 states. Presentations were in varied disciplines including sciences, humanities and social sciences. Morgan Turner, Belmont University , Taeler Dahm, Belmont University . Eeleyah Singh Tanwar, Belmont University. Chemotaxis Assay of Caenorhabditis elegans to Bacillus thuringiensis strain 4A4 in vegetative and sporulated growth stages. Pictured above (L to R): Dr. Laura Stephan, Julisa Nunez, Eeleyah Tanwar, Angel Brothers, Morgan Turner, Dr. Darlene Panvini and Robin Weyman.